3 stars of colourful but mildly confusing film noir. 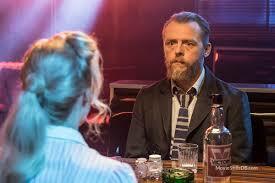 Terminal is written and directed by Vaughn Stein and is a very promising effort for his feature directorial debut. The film is set in an unnamed city and the Terminal of the title is a railway station, in which most of the action takes place. It is a film noir style story set in a neon soaked dystopian city, where every major location shines like a beacon in the brooding darkness of the streets at night. The story revolves around Annie (Margot Robbie – Suicide Squad, Peter Rabbit), a waitress at the appropriately titled railway cafe, End of the Line. It is here that she meets terminally ill and suicidal English teacher Bill (Simon Pegg – Shaun of the Dead, Star Trek) and her dark obsession with death is revealed. We also see the story of two assassins, Vince (Dexter Fletcher – Eat Locals, Smoking Guns) and Alfred (Max Irons – The Host, The White Queen) who are sat in a hotel room waiting for the go on a job from the mysterious Mr Franklin. Tying everything together is the strange night cleaner at the station, Clinton (Mike Myers – Shrek Forever After, Inglourious Basterds) who seems to know an awful lot about what goes on in the station. The Terminal is an enjoyable watch and is visually stunning. However, it is all quite disjointed and the story is very fragmented, making it a bit difficult to follow the plot. When it does get to the conclusion, there are a few too many twists, a bit too much going on. There are plenty of good ideas, but they don’t all need to be in the same film. A good start and I look forward to future work from Vaughn Stein. All in all, not a bad way to spend an evening and well worth a look. 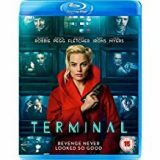 Terminal is available to buy now on DVD and Blu-ray.